Combining an adventurous spirit, a passion for great coffee, and the desire to leave cubicle chaos behind tied in perfectly with the dream of Drip! Mobile Espresso. We love to deliver quality coffee and espresso in every cup and hope you think so too. Drip! 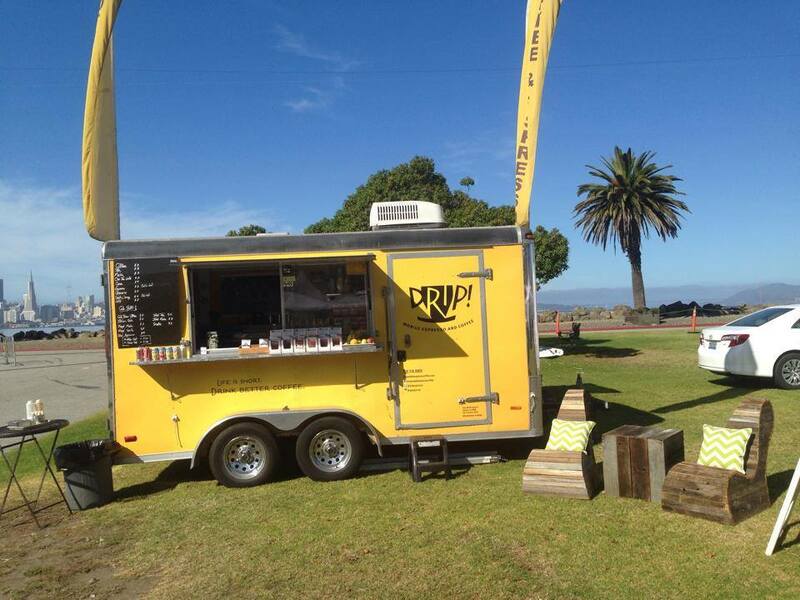 Mobile Espresso & Coffee will provide you with the highest quality handcrafted coffee and espresso beverages. Drip! services not only the Bay Area, but is willing to travel to your event (West Coast). You provide the set up location, we do everything else. Our mobile espresso and coffee trailer is fully self-contained, impeccably clean, and can be set up in less than 30 minutes at the location of your choice. Hourly or day rates available with unlimited beverage service! Going to the Alameda Point Antiques Faire? Treasure Island Flea? Or any of the many various music festivals in the Bay Area? Look for the bright yellow truck that is Drip! You’ll be glad you did after drinking THE BEST hot coco, drip coffee, and espresso drinks any “food” truck has to offer.